Marie Dern: " I began Jungle Garden Press in Berkeley, California, in 1974. The press is named for my backyard, overgrown with wild roses, errant onions, and a tangle of tulip vines." Fairfax, California: Jungle Garden Press, 2016. Edition of 10 variants. Letterpress printed. Each version unique (Popup, sculptural, collage and pastepapers, encaustic, torn paper, knots, ladder, wood type). Numbered. "The Wreck of the Hesperus" interpreted by artists Danielle Giudici Wallis and Marie C. Dern. Jungle Garden Press: "This is a Wonder Book. We wonder what will happen. Ten copies were letterpress printed. Multiplication. Five were sent to Danielle. Division. Danielle used addition and subtraction. She sent these to Marie. Marie did the same, but different. Additional copies went back and forth. Until the sum of 10 emerged with variable differences." Encaustic version, copy 3: 8.75 x 10.9"; 24 pages. Bound by John DeMerritt in green cloth boards. Pastepaper version, copy 2: 7.5 x 10.5"; 16 pages. Collage. Sewn and paper tape binding. Colophon attached by thread loop. Fairfax, California: Jungle Garden Press, 2015. Edition of 15. 6.75 x 10.5"; 10 leaves. Designed and letterpress printed by Marie C. Dern with plates made by Richard Seibert on handmade paper from Twin Rocker. The poems are printed in the poet's handwriting. All other text printed with handset Garamond type. Silkscreen prints by Martha Shaw. In gray cloth-covered box made by John DeMerritt. Signed by the poet on the colophon. Numbered. First publication of these seven poems by Kay Ryan. Fairfax, California: Jungle Garden Press, 2011. Edition of 50. 7 x 10"; 54 pages. Letterpress printed by Marie Dern and Richard Seibert on Johannot paper using Verdana type. Book design by Marie Dern. 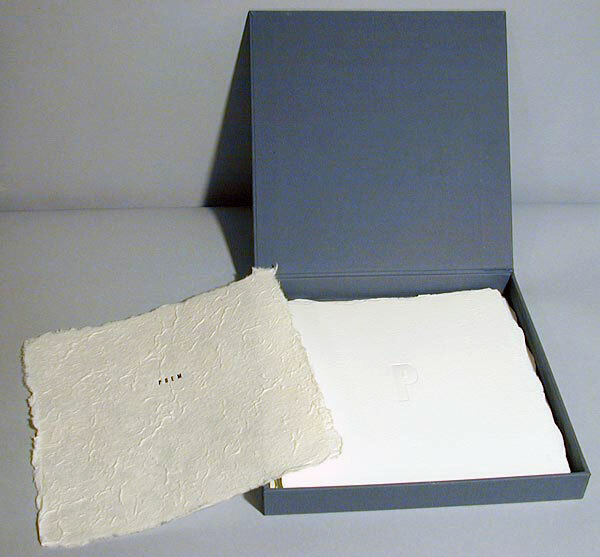 Bound by John DeMerritt in paper made for the edition by Cave Paper. Enclosed in a sleeve with latch. Signed by the author and the artist. Jungle Garden Press: "The text is an arrangement of poems and prose cumulatively described by Berkson as 'entries.' Drawings by Léonie Guyer accompany the text; delicate and humorous, they seem enigmatic and familiar at once." Versions of some of these writings (2005-2010) appeared in The Can, Dorado, The Brooklyn Rail, The Tsatsawassans, and Lady Air (Perdika Press, 2010). Bill Berkson (1939 - ) is a poet, critic, teacher, and sometime curator, who has been active in the art and literary worlds since his early twenties. projects. She was born in Queens, New York, and now lives and works in San Francisco. She received her BFA and MFA from the San Francisco Art Institute. She has taught at the Art Institute and at the California College of the Arts. Fairfax, California: Jungle Garden Press, 2008. Edition of 15. 7.25 x 9"; 11 pages, 5 of which fold out revealing 10 additional pages. Printed letterpress with Garamond type on Hosho paper. Drawings digitally printed. Typeface: Claude Garamond. Bound by hand in a black Momi "bag" of wool, wool "tail" on the spine. Text reinterpreted by Marie C. Dern. Line illustrations by Martha Weston. Marie Dern: "Delightful drawings of lost sheep eventually found in the pages of the book." Fairfax, California: Jungle Garden Press, 2006. Edition of 50. 6.375 x 9.125”; 36 pages including free end papers. Printed letterpress. Prints and cover papers hand silk-screened by Martha Shaw. Typeface: Centaur; paper: Somerset. A short story by Marie Dern about the small miracles: growing plants, growing hair, growing love. Luminous silkscreen images by Martha Shaw. Fairfax, California: Jungle Garden Press, 2005. Edition of 10. 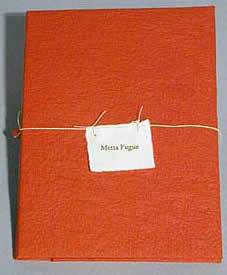 10 x 13.5" with eleven pages - title page plus one page per number one through 10. Each number uses a different font. Pages laid in paper covered boards with title on front board. Title of "1, 2" is on paper to resemble a chalkboard. Dern uses the nursery rhyme 1, 2 Buckle My Shoe to produce a lovely wood type book. Each of the numbers 1 through 10 has its own page using a different wood type. The book is produced like a portfolio of wood type so that the pages are not bound but laid in a binder with a ribbon tie. 1, 2 Buckle my shoe. 3, 4 Shut the door. 5, 6 Pick up sticks. 7, 8 Lay them straight. 9, 10 Big fat hen. Fairfax, California: Jungle Garden Press, 2005. Edition of 60. One 6 x 8 x 3.75" metal tree sculpture and one two-sided accordion 4.25 x 10.5" book housed in 12.75 x 11.25 x 3.5" sawn-pine box. Book composed of nine panels featuring 18 drawings. Type is Bembo. Drawings printed with photopolymer plates an printed on Arches watercolor paper. Sculpture made of steel, brass and tin. Binding by John De Merritt. 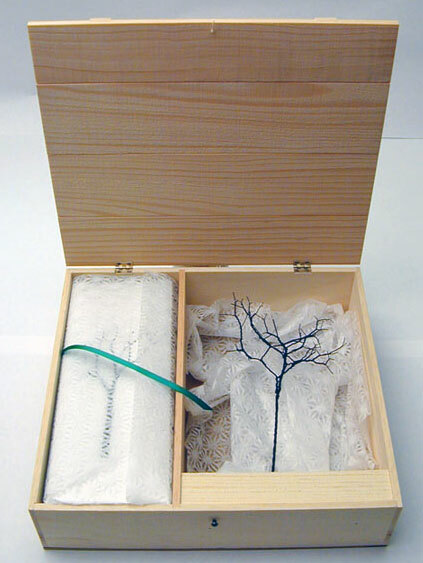 Box design by Marie Dern. Lid to box hinged for opening with cord. Interior divided into two compartments for holding sculpture on right and book on left. Book wrapped in lightweight white gauzy snowflake design Japanese paper. Sculpture nestled in the same paper. A collaboration of husband and wife, Carl and Marie Dern. The accordion book of Carl's drawings can be moved around to form various configurations to simulate an orchard setting. Carl's accompanying metal tree sculpture can be placed 'among' the pages or off to the side. Simple, elegant, appropriately stark. A nice combination of the book and sculptural art. Fairfax, California: Jungle Garden Press, 2003. Edition of 10. 3.5 x 5.5"; six paneled accordion structure. Printed letterpress. In paper covered boards with raffia tied at board ends to simulate hair. Collage and three vignettes about hair. Word and illustration play on hairdos: Pixie, Bob & Weave, Mohawk, Conk, and Crew Cut. 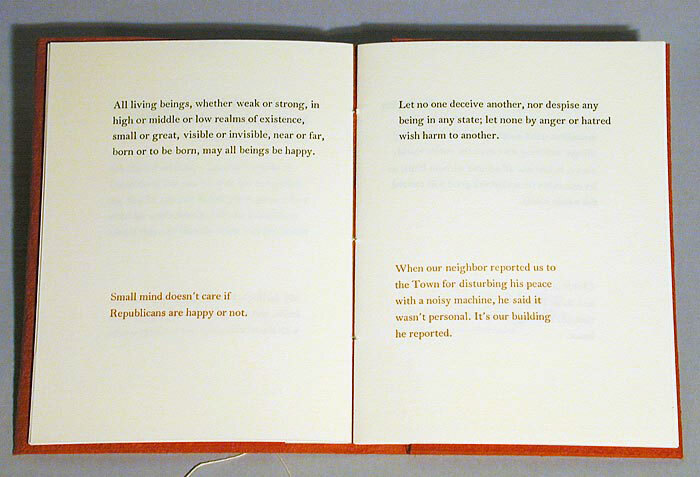 Marie Dern: "From the beginning I have printed books using a Chandler & Price and a Vandercook letterpress. 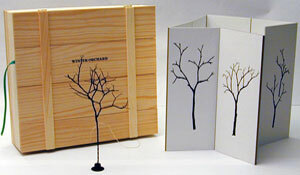 The books are bound by hand by me or professional bookbinders. Early on I was almost exclusively interested in printing poetry by contemporary authors, but in the past few years, I have printed short prose and have collaborated with visual artists. I also write, print, and bind my own books, some in small editions, and some one of a kind." This section is devoted to Jungle Press Garden poetry editions. Fairfax, California: Jungle Garden Press, 2010. Edition of 10. 7.5 x 9.75"; 32 pages. Letterpress printed in Goudy Old Style type on Okawara paper. Four-needle, non-adhesive binding. Bound in handmade mulberry paper. Laid in wrapper of handmade Shizen screen-printed papers with string and bead closure. Designed and printed by Marie Dern. 12 poems by Dogen - 13th-century Japanese monk, philosopher, mystic, and poet - and drawings by Carl Dern - artist, sculptor, and humane soul - who died in 2009. Marie Dern: "My husband and I were (are) both students of Zen Buddhism and interested in Dogen, the 13th- century monk. I like to think the exterior of the book looks like a priest's robe." Fairfax, California: Jungle Garden Press, 2003. Edition of 30. 4 x 6"; 20 pages including free end leaves. Handbound in a red paper wrapper. Single red bead tied into exposed spine thread. 1 x 1" title label attached to thread which trails across the front cover. Buddhist prayer printed along the top of the page in black. Dern's response printed in red at the bottom half of the page. Another original book from Marie Dern with her special stamp, this time about loving-kindness. A Buddhist prayer is said out loud (or silently) to request the well being for others (and oneself.) It is a dialogue or fugue between the sutra and what is going on in Marie's head (which is mostly irreverent and amusing!). Republicans are happy or not. Fairfax, California: Jungle Garden Press, 2002. Edition of 125. 5 x 10.75"; 30 pages. Letterpress printed from handset Bell type on Lana watercolor paper. Dern's drawings were transferred to polymer plates and printed in a variety of colors. Handbound in red cloth over boards with black cloth spine and gold-stamped spine title. An large, inset exclamation point illustrates the cover as well as the title page. Ryan's entertaining poems were penned in response to a selection of absurdities from Ripley's Believe It or Not. Ryan, a Ripley's fan, owns many of Ripley's collections and set herself the task of writing a poem a day based on a reading from one of the books. Of the hundreds she wrote, some have been previously published, but this collection is new. Her witty verse renderings each include, as epigraph, the bizarre fact from Ripley's that inspired the quote. Many of the poems are accompanied by Carl Dern's delightful drawings. As ever, publisher & printer Marie Dern's sense of whimsy and play is evident. Fairfax, California: Jungle Garden Press, 2002. Edition of 5. 9 x 9" square; four pages. Printed on deckled Twin Rocker paper. Housed in a gray cloth box. 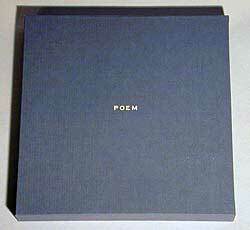 POEM is literally a poem in a box. Each page is a letter of the word POEM, conceived because of some donated wood type. It is printed on deckled Twin Rocker paper where the type leaves a shadow because of the bite.